The new Alps 2 Ocean Cycle Trail from Aoraki Mount Cook to the Oamaru coastline has developed a bold and easily recognisable brand to fulfil two objectives: first, to make it super easy for cyclists and walkers to find their way and second, to establish a brand and identity around the distinctive communities that surround the trail. Cycle trail joint committee chair Mike Neilson said the new brand, designed by Kiriana Glasson of Oamaru, had a big job to do. “We really wanted to tie in with the national brand – we didn’t want to have something separate because this trail is a part of the national cycleway but it is also developing its own identity which we wanted to express. 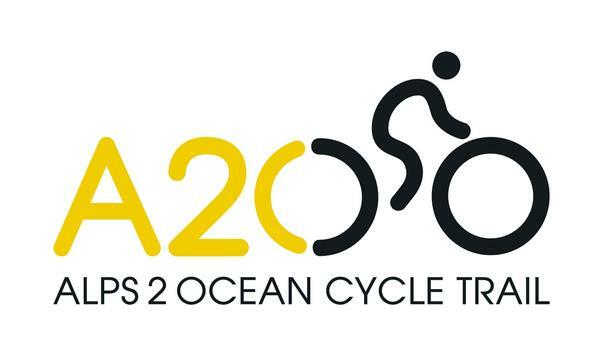 Designer Glasson said she needed to meet the brand guidelines of the national cycle logo while achieving the goals of the local Alps 2 Ocean committee. “The Ministry of Economic Development is working through a process to get the national brand on road signs throughout the country. This will lead to huge recognition of the national cycleway brand. My thinking was that the best way we could ensure rapid recognition of the Alps 2 Ocean brand was to make the national one a recognizable part of our own. Neilson said Glasson had achieved the two objectives and that the committee was delighted with the results. “It was also important for us to have a brand that reflected our surroundings and identity in its look, style and colourways, while being versatile enough to use across a variety of mediums, from on trail signage to consumer websites, brochures and social media as well as all marketing and trade material. Some sections of the 312km trail, designed to showcase the amazing diversity of the Mackenzie and Waitaki regions in New Zealand’s South Island, will be ready for cyclists to trial by this Christmas. Completed sections of the trail are not yet connected, but a signposted cycle loop available out of Twizel, at the southern end of Lake Pukaki, will be available for people to enjoy over the Christmas holidays. Other sections of the track are expected to open by mid-January. The full Alps 2 Ocean Cycle Trail is expected to be officially opened in November 2012 as part of Nga Haerenga, The New Zealand Cycle Trail. The trail will eventually descend 780m through the Mackenzie Basin down the Waitaki Valley to the Victorian town of Oamaru.